A Momprenuer Successfully Balances it All! Not only is Angie Light an energetic always on-the-go wife, she is also the mother of a beautiful 3 year old boy. In addition, she is an incredibly hardworking businesswoman who makes the time to balance it all! Her first vocation is being an actor and doing stage work. She also owns her own business as a representative for Rodan & Fields Skincare! Prior to doing all that she does now, she worked for Sony and AIG SunAmerica as an Administrative Assistant. Recently, I had the chance to catch up with Angie and ask her a few questions so that I could share her successes with all of you! The first thing I had to know was what brought her into Rodan & Fields Skincare. Angie let me know that the job she had before Rodan & Fields relocated to San Francisco and she declined the offer to relocate with them. 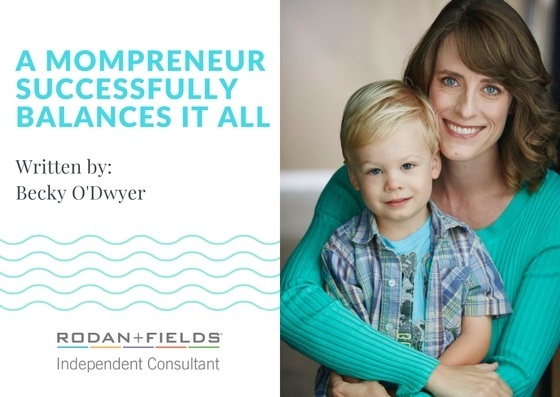 It was 2015 and she had found herself in a predicament that I believe a lot of moms find themselves in…….which was being with a new baby without employment, without disability benefits and having a severance package run out. Angie knew that she didn’t want to go back to work full-time because she had a little boy to raise, but she still wanted to bring in some income into her household. After doing a good amount of research, Angie realized Rodan & Fields Skincare was an amazing opportunity she couldn’t pass up! Knowing that Angie is so multi-faceted, I wanted to know more! I asked her what a day in the life is like for her. She told me it varies a lot. She takes her son to Mommy & Me class twice a week. Also, soccer practice and soccer games are each once a week. Plus, there are various networking events, playdates, and auditions! Every day is a full day! Like many of us, Angie’s job as a mom comes first, but she always finds a way to balance it all! She uses her son’s nap time and time when her husband is home to take care of their little one to make business calls. She also refers to Playdate Connection as “Brilliant” for allowing her to network while her son is with her! She says that some of the best parts of being a mom are: feeling like she is making a difference in the world, hearing her son say “I love you”, being closer to both her husband and her parents. Angie truly is a breath of fresh air! She is a well-rounded woman with the world at her fingertips and a true blessing to know! I feel very fortunate to know her through Playdate Connection! ← A Beautiful Balloon Business Booms! © 2017 Playdate Connection. All Rights Reserved.